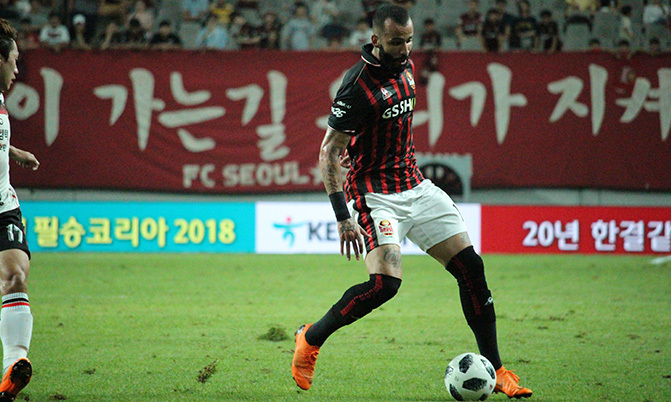 FC Seoul, South Korea's capital club and one of the K-League's most famous find themselves locked in a relegation battle. in the K-League promotion/relegation playoff against Busan I'Park. Depending on who wins the two-legged playoff final, the teams will either swap leagues or remain where they are for another season. One of South Korea's biggest and most iconic clubs FC Seoul find themselves in a relegation battle, something that would have been unheard of a few years back when they were winning the K-League title as recently as 2016. From 2016 until now, the club has seen a rapid demise in two seasons, as they've slid down the table to finish 11th, in the 12 team league only propped up into the relegation playoff, instead of direct relegation by Jeonam Dragons. They travel to Busan I'Park who must be chomping at the bit for the chance to relegate FC Seoul as it would send a shock wave through Korean football, showing that any club which is run badly can deteriorate that much that they could possibly find themselves in a similar situation as FC Seoul are in now. Then with none of the big Korean clubs would want that so if you're a supporter of any of K League 1's other iconic clubs you would hope they would be taking note of what has gone wrong at FC Seoul to make sure they don't follow in their footsteps. Busan I'Park will be at home for the first leg and it will be interesting to see how they approach the game in this situation. Will it be cagey, or will they set out to attack from the off. If I were there manager and had the first leg at home first, I would set them up to attack from the off and get stuck right into FC Seoul to see if they have the guts for the fight or not. If they have the guts for the fight, then you may have to rein the team in a bit because you wouldn't want to be caught by a sucker punch on the counter, but if you got any sense that Seoul was crumbling under the pressure you would want your team breathing down their neck, pressuring them and right in the thick of the action as much as possible for the home game, with your fans behind you. The idea would be to pile on that much pressure that it would make them crumble from not experiencing this kind of situation before, and therefore you could rack up a big first-leg lead. If you were the Seoul manager, you would probably be looking to keep the game as tight and the scoreline as close as possible to take it back home in the second leg and give Busan a pummelling. in front of a celebratory home crowd. That would be the plan from me for both sides in this situation anyway, but as we all know the best-laid plans can go to crap in an instant so regardless of the plan the game could still go either way. If you can watch these games, you should! If you do get the chance to watch these games, I would tell you to make sure you do it. This is possibly one of the biggest promotion/relegation playoffs in South Korea for some time, and if Busan I'Park wins the game over two legs you could be seeing something special (or comedy gold) as FC Seoul plummet to the second tier of South Korean football. To be honest, its a bit of a shame the game is not just a one-off and at a neutral venue, that would be more likely to boost the attendance too I'd guess, but the K-League has their own way and two legs it is. I have always believed two-legged games for finals often favour the bigger club, but the reason the KFA have decided to make it two legs could be for any number of logical or illogical reasons. Either way, if you are free to watch the two playoff games then I would advise you do because it is going to be huge. The first leg is played tomorrow and the second leg will take place on Sunday. Check the kick off times yourself to make sure you have the correct time, for your time zone. We predict an FC Seoul win over two legs, although it would be rather amusing to see a Busan I'Park win, and it seems that a lot of the football community in South Korea is rooting for this too. Good luck to both teams.